Westminster Hall in the early nineteenth century. The oldest part of the Palace of Westminster which houses Parliament, it dates from 1097. Charles I's impeachment took place in this Hall. The Long Parliament is the name of the English Parliament called by Charles I, on November 3, 1640, following the Bishops' Wars. It receives its name from the fact that by a unique Act of Parliament, it could only be dissolved with the agreement of the members, and those members did not agree to its dissolution until after the English Civil War and at the end of Interregnum in 1660. It sat from 1640 until 1649, when it was purged by the New Model Army of those who were not sympathetic to the Army's concerns. Those members who remained after the Army's purge became known as the Rump Parliament. During the Protectorate the Rump was replaced by other Parliamentary assemblies, only to be recalled after Oliver Cromwell's death in 1658 by the Army in the hope of restoring credibility to the Army's rule. When this failed, General George Monck allowed the members barred in 1649 to retake their seats so that they could pass the necessary legislation to initiate the Restoration and dissolve the Long Parliament. This cleared the way for a new Parliament, known as the Convention Parliament, to be elected. Monarchs traditionally convened Parliament to raise money but gradually Parliaments took over the function of governance as those whom they represented became increasingly reluctant to fund wars in which they had little or no interest. The notion of the state as a community or commonwealth in which the ruled as well as the ruler had rights eventually resulted in the modern nation state in which the people are citizens, not subjects. Even in a constitutional monarch, which effectively applied to the United Kingdom after the English Civil War and the Glorious Revolution, the office of monarch as Head of State remains hereditary but symbolic, lacking any political power. The sole reason Charles I assembled Parliament was to ask it to pass finance bills, since the Bishops' Wars had bankrupted him. Fought between Scottish Calvinists and others in Scotland, including many aristocrats who did not want bishops and the English in 1638 and 1640, the wars determined the future shape of the established Church of Scotland as non-episcopal. The Scots opposed bishops for both theological and political reasons, while the King saw them as essential for correct order arguing that bishops were essential in a monarchy—if society was a hierarchy, the church must be one too. Advocating the 'divine right' to rule, he thought that a bishop-less Church undermined this claim. The Parliament was initially influenced by John Pym and his supporters. 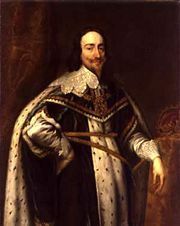 In August 1641, it enacted legislation depriving Charles I of the powers that he had assumed since his accession. The reforms were designed to negate the possibility of Charles ruling absolutely again. The parliament also freed those imprisoned by the Star Chamber. A Triennial Act was passed, requiring that no more than three years should elapse between sessions of Parliament and the Dissolution Act which required the Long Parliament's consent to its own dissolution. Parliament was also responsible for the impeachment and subsequent execution of the king's advisers, Archbishop William Laud and Thomas Wentworth, Earl of Strafford. The Irish Rebellion which started in October 1641 brought the control of the army back into the discussions between King and Parliament. Led by John Pym, Parliament presented the King with the Grand Remonstrance which was passed in the Commons by 11 votes (159 to 148) on November 22, 1641. It listed over 150 perceived "misdeeds" of Charles' reign including the Church (under the influence of foreign papists) and royal advisers (also "have[ing] engaged themselves to further the interests of some foreign powers") the second half of the Remonstrance proposed solutions to the "misdeeds" including church reform and Parliamentary influence over the appointment of royal ministers. December 1641 Parliament asserted that it wanted control over the appointment of the commanders of the Army and Navy in the Militia Bill. The king rejected the Grand Remonstrance and refused to give royal assent to the Militia Bill. The King believed that Puritans (or Dissenters) encouraged by five vociferous members of the House of Commons, John Pym, John Hampden, Denzil Holles, Sir Arthur Haselrig and William Strode along with Lord Mandeville (the future Earl of Manchester) who sat in the House of Lords, had encouraged the Scots to invade England in the recent Bishops' Wars and that they were intent on turning the London mob against him. When rumours reached the court that they were also planning to impeach the Queen for alleged involvement in Catholic plots Charles decided to arrest them for treason. The Speaker of the House during the Long Parliament was William Lenthall. On January 4, 1642, the king entered the House of Commons to seize the five members. Having taken the speaker's chair and looked round in vain to discover the offending members commenting "I see the birds have flown," Charles turned to Lenthall standing below, and demanded of him whether any of those persons were in the House, whether he saw any of them and where they were. Lenthall fell on his knees and replied: "May it please your Majesty, I have neither eyes to see nor tongue to speak in this place but as the House is pleased to direct me, whose servant I am here." After his failure to capture five members and the fearing for his life Charles left London for Oxford. Most of the royalist members of Parliament left to join him there where they formed the Oxford Parliament. Without its royalist members, the Long Parliament continued to sit during the Civil War and beyond because of the Dissolution Act. In March 1642 with the King absent from London and the war clouds gathering, Parliament decreed that its own Parliamentary Ordinances were valid laws without royal assent. The Militia Ordinance was passed on March 5 by Parliament which gave Parliament control of the local militia called Trained Bands. Control of the London Trained Bands was the most strategically critical because they could protect the radical members of Parliament from armed intervention against them by any soldiers which Charles had near the capital. In response to the Militia Ordnance, Charles revived the Commissions of Array as a means of summoning an army instead. The Palace of Westminster at dusk, showing the Victoria Tower (left) and the Clock Tower colloquially known as 'Big Ben', lies on the bank of the River Thames in the heart of London. Although most of the Palace dates from the nineteenth century, is has become a symbol of the Mother of Parliaments and of democratic government. Divisions emerged between various factions, culminating in Pride's Purge on December 7, 1648, when, under the orders of Oliver Cromwell, Colonel Pride physically barred about half of the members of Parliament from taking their seats. Many of the excluded members were Presbyterians. In the wake of the ejections, the remnant, the Rump Parliament, arranged for the trial and execution of Charles I. It was also responsible for the setting up of the Commonwealth of England in 1649. Oliver Cromwell forcibly disbanded the Rump in 1653 when it seemed they might disband his expensive army of 50,000 men. It was followed by the Barebones Parliament and then the First, Second and Third Protectorate Parliament. After Richard Cromwell, who had succeeded his father Oliver as Lord Protector in 1658, was effectively deposed by an officers' coup in April, 1659, the officers re-summoned the Rump Parliament to sit. It convened on May 7, 1659 (OS), but after five months in power it again clashed with the army (led by John Lambert) and was again forcibly dissolved on October 13, 1659. Rule then passed to an unelected Committee of Safety, including Lambert; but as General George Monck, who had been Cromwell's viceroy in Scotland, began to march south, Lambert, who had ridden out to face him, lost support in London—the Navy declared for Parliament, and on December 26, 1659, the Rump was restored to power. Monck, whom Lambert had failed to confront, continued his southward march. On February 3, 1660, Monck arrived in London. After an initial show of deference to the Rump, Monck quickly found them unwilling to cooperate with his plan for a free election of a new parliament; so on February 21, 1660, he reinstated the members 'secluded' by Pride, so that they could prepare legislation for the Convention Parliament. Having called for elections for a Parliament to meet on April 25, the Long Parliament dissolved itself on March 16, 1660. The Long Parliament was preceded by the Short Parliament. It was purged by Pride to become the Rump Parliament, dissolved by Cromwell, restored (as the Rump) twice in 1659, restored to its pre-purge state by Monck, and succeeded by the Convention Parliament. ↑ Act against Dissolving the Long Parliament without its own Consent, May 11, 1641, Full text of the Act against Dissolving the Long Parliament without its own Consent Retrieved March 9, 2007. ↑ 2.0 2.1 "Dissolving Parliament," House of Commons Journal Volume 7: British History,March 16, 1660 (New Style), Dissolving Parliament Retrieved March 9, 2008. ↑ By the time of the Restoration Lenthall seems to have forgotten his previous resolve when he consented to appear as a witness against the regicide Thomas Scot, for words spoken in the House of Commons while he was the Speaker. ↑ According to contemporary royalist legal theory, the Long Parliament was regarded as having been automatically dissolved form the moment of Charles I's execution on January 30, 1649 (New Style). This view was confirmed by a court ruling during the treason trial of Henry Vane the Younger. Keeler, Mary Frear. 1954. The Long Parliament, 1640-1641; a biographical study of its members. Memoirs of the American Philosophical Society, v. 36. Philadelphia: American Philosophical Society. This page was last modified on 25 July 2018, at 16:04.